Why spend thousands of bucks on a vacation to somewhere like the Caribbean when there are perfect beaches with crystal-clear waters in the Midwest? With over 3,200 miles of shoreline on its Great Lakes, Michigan is the second largest shoreline state in the United States. Relax on pristine beaches and spend your vacation sunbathing and swimming on the eastern shore of Lake Michigan. The best thing about beaches in Michigan is that there are many options to choose from. 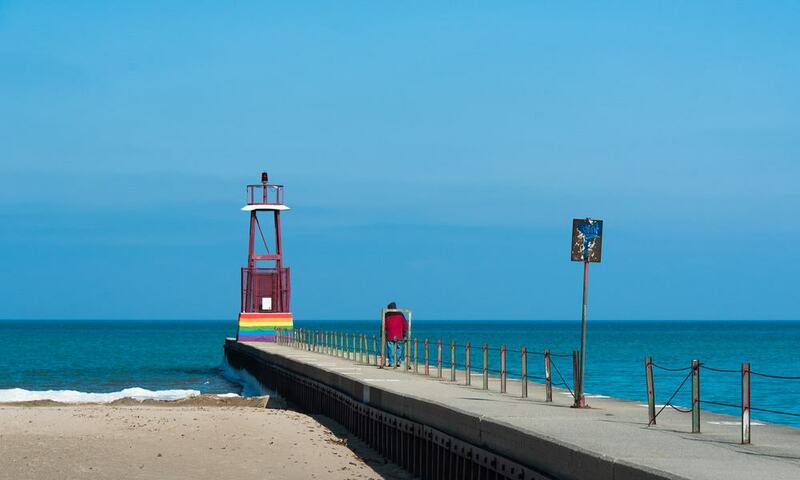 Whether you’re looking to find a pretty family beach with plenty of facilities or a beach graced with golden sands and ideal conditions for fishing, there is something for everyone on Michigan’ shoreline. 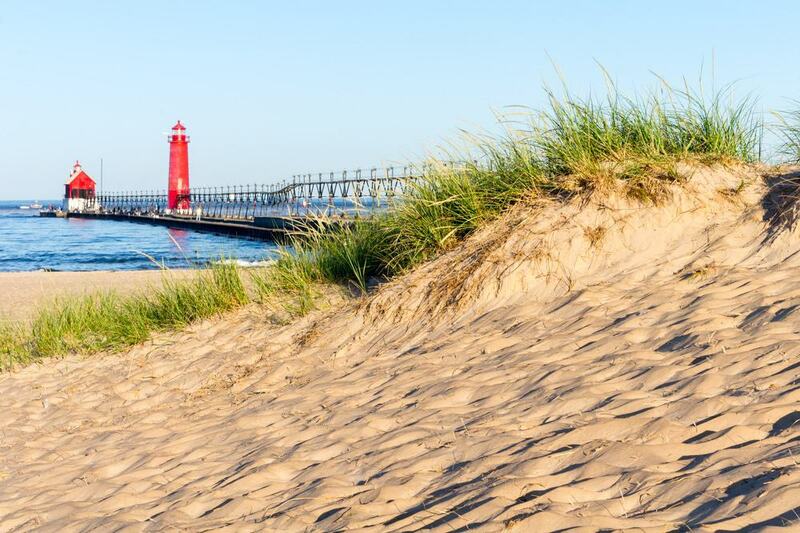 A classic summer beach that includes a 48-acre state park, Grand Haven is one of the most popular vacation spots in Michigan. The beach features all the amenities you’d expect from a good beach but this comes at a cost – the entrance fee to the state park is $9/day. There is a picturesque red lighthouse and a beautiful boardwalk that goes all the way to the center of the town. Head out to Morning Star Café for breakfast or eat Mediterranean food for lunch at Elegance of the Seasons. For fabulous cocktails, visit the Snug Harbor and Jack’s Waterfront Bistro. For those with a canine friend in tow, there is a pet-friendly beach in the vicinity of Grand Haven where you can take your dog for walks. Featuring over 150 campsites, Orchard Beach State Park is located on a bluff that offers amazing views of Lake Michigan. From there, you can use the staircase which offers easy access to the beach below. Some of the most popular activities here include swimming, fishing, hiking, and picnicking. You can even go cross-country skiing during the winter season! The actual harbor consists of two piers and amenities such as public restrooms and picnic facilities are provided. The campsite is well-equipped and includes two showers and restroom buildings, a mini cabin, and two paved sites for campers with mobility issues. One of the main attractions in the area is taking a trolley ride on a tour of Manistee. 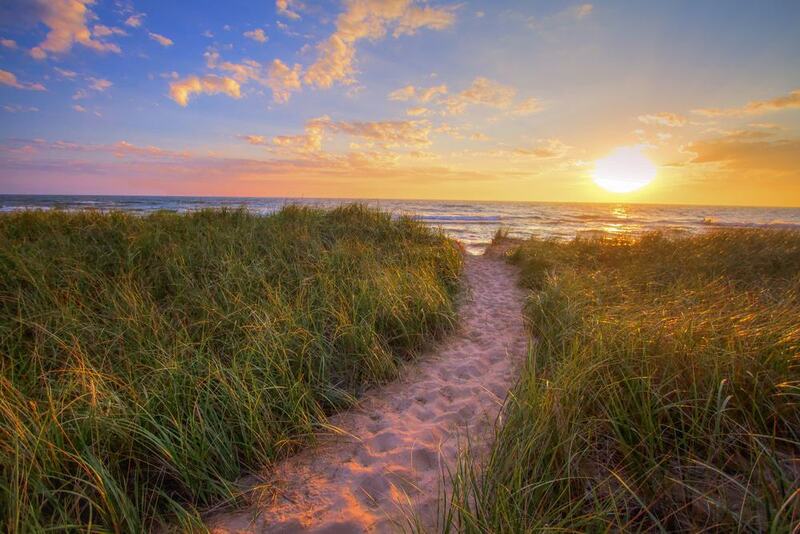 Voted as one of the most beautiful places in the United States because of its panoramic vistas and 60 miles of shoreline, Sleeping Bear Dune National Lakeshore features golden sand beaches and lush forests with amazing flora and fauna. You can climb the dunes and enjoy spectacular views of cute farmsteads and the island’s lighthouse. When it comes to activities, hiking through the forest, bird watching, and canoeing on the inland lakes are some of the best options. 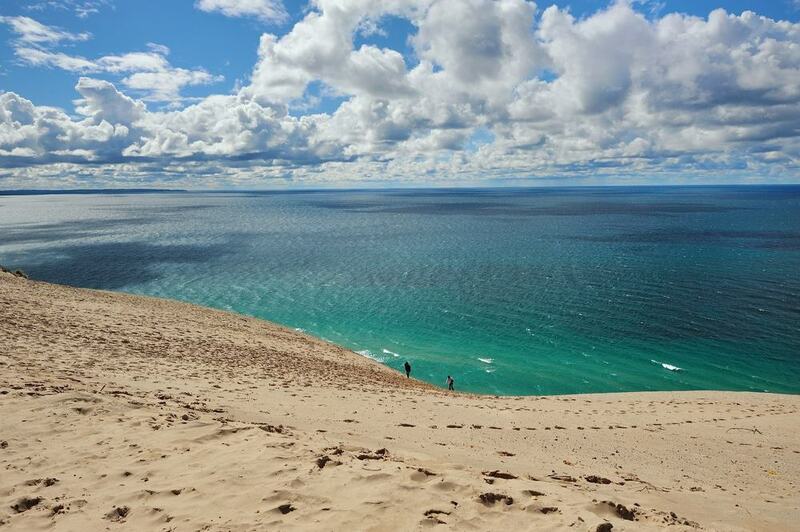 Families will just love the Sleeping Bear Dune National Lakeshore and its dozens of inland lakes to explore, and the for kids, the dunes are one huge fun playground. 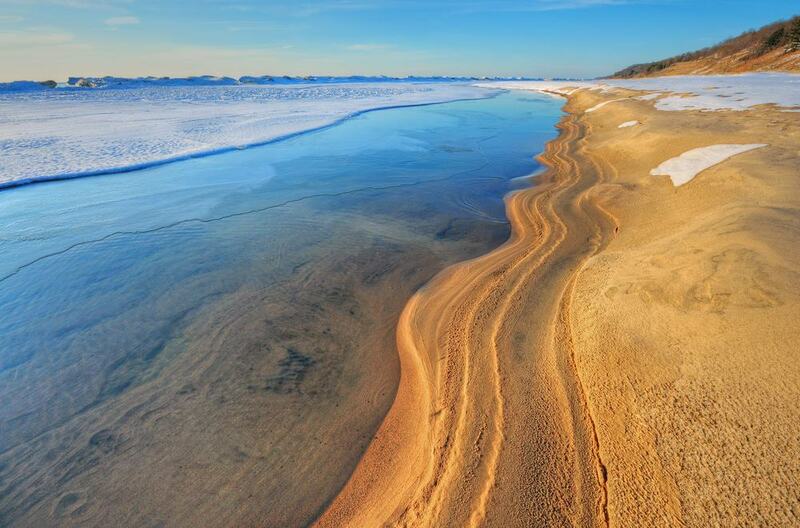 Nestled at Sleeping Bear Dunes National Lakeshore, Empire Beach is one of the most beautiful beaches in the area and attracts large crowds of both tourists and locals. This dog-friendly beach is a perfect getaway for all those adventurous vacationers who want to combine water activities with hiking, bird-watching, and enjoying nature. You can go for a low-key bike ride down one of the many paths or take a self-guided road trip and explore the surrounding area. There’s no need to worry about heading out on your own and getting lost here because the area is extremely easy to navigate. Named after the location where Lake Michigan and Manistique River meet, Manistique actually used to be a lumber town that is now a premium destination for recreational activities during the summer season. This amazing place consists of a natural harbor and beach area that is mostly visited by the locals. Travelers who enjoy nature will have the opportunity to walk around the many trails and visit several historical landmarks. Fishing, boating, camping, and hunting are just some of the most popular activities here at Manistique. You can even go snowmobiling in winter! There are several restaurants that serve delicious local dishes, as well as a couple of nice souvenir shops and boardwalk stands. Head out to the Seul Choix Point Lighthouse and take a tour of the famous ghost town from the 19th century, Fayette. 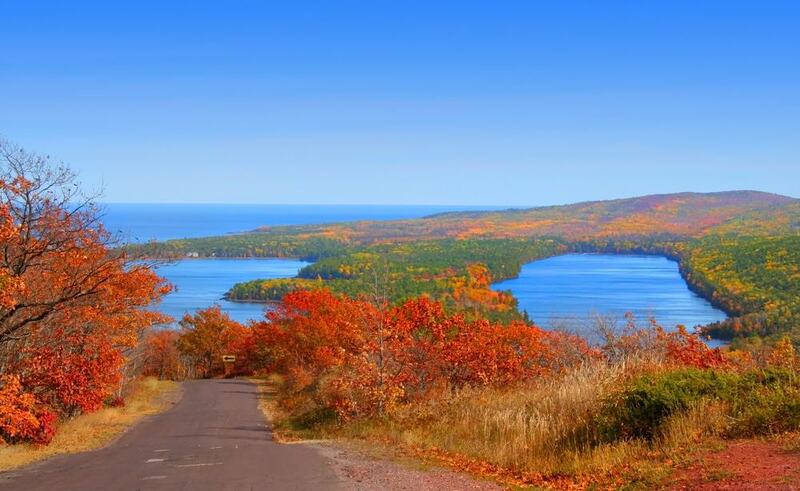 Located in northern Michigan, Copper Harbor is famous for its scenic beauty and features a world-class mountain trail system for fabulous hiking. If you wish to visit Copper Harbor’s well known lighthouse, make it an adventure and go on a sea kayak tour. For the less adventurous, you can also explore dozens of quaint galleries and shops or play a game of mini-golf. Did you know that this Copper Harbor was used by the Pittsburg and Boston Mining Company for transporting goods? Today, however, Copper Harbor is used for commercial and recreational purposes such as ferrying passengers from Isle Royale National Park to northern Michigan. Spend a day at lovely Copper Harbor beach that is located just across from the lighthouse. The beach is quite picturesque – beautiful enough for the many newlyweds who come here to take their wedding photos. Warren Dunes State Park is one of the most popular parks in the state and attracts over one million travelers each and every year. All of them come to enjoy the beautiful lakeshore beaches and explore the large rolling sand dunes. The dunes here are epic enough to simply be admired and be the subject for landscape photographers, but for active visitors, you should definitely consider a fun climb up the slopes and sand board your way back down. 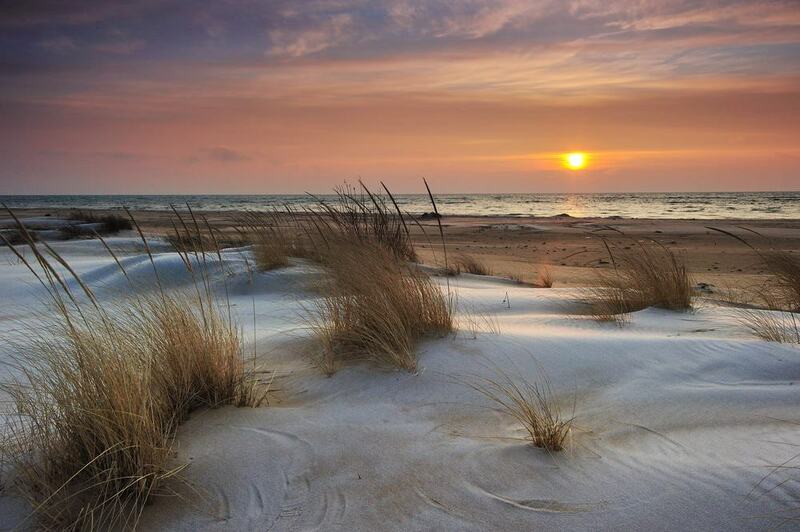 Make sure to climb the tallest sand dune in Warren Dunes State Park, Tower Hill. Tower Hill offers amazing views of Lake Michigan and beyond. Some call it the Salmon Capital of Michigan, while others refer to it as the Nautical City because of its ties to the shipping industry. Rogers City is home to one of the largest ports in the area and features several lovely beaches where locals come to unwind and top up their sun tans. Fishing is one of the main activities here and you will see many fishermen on the purpose built fishing platform which is one of the most recent additions to the harbor. There is even an annual salmon fishing tournament in Rogers City. Located in St. Joseph, Tiscornia Beach is an amazing spot to spend quality time with family and friends. The beach is situated on Lake Michigan and offers plenty of interesting activities and spectacular views of the surrounding area. Visitors can go swimming, access the North Pier, or experience climbing up and down the sand dunes. There is a picnic area on the beach, as well as a bathing area, public restrooms, and a pavilion. The good news is that Tiscornia Beach is open throughout the year and offers perfect conditions for swimming in its calm waters. Head out to the North Pier to watch the fisherman or spend an entire day under the sun on Tiscornia Beach. Keep in mind that bringing animals and alcohol to the beach is not allowed. 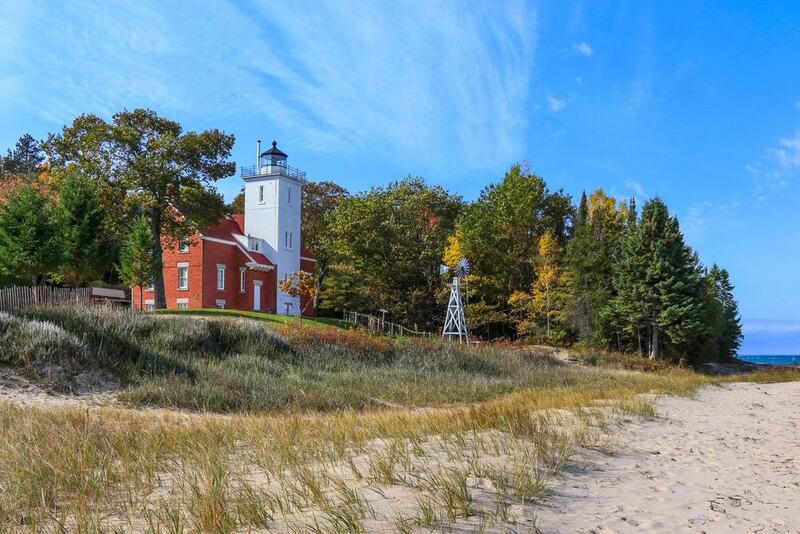 Nestled between Ludington and Muskegon, Silver Lake Sand Dunes is a perfect summer destination for various activities including boating, hiking, four-wheeling, and golfing. This secluded beach located along Lake Michigan’s shoreline is a perfect romantic getaway for couples looking to find some peace and privacy. There are more than 2,000 acres of rolling sand dunes that separate the lake from the beach. However, getting to the beach is not easy, you need to walk for approximately 45 minutes from the Silver Lake parking area. If you’re not up for the long walk, you can drive in an off-road vehicle straight over the dunes and onto the beach. Saugatuck Dunes State Park Beach features almost three miles of shoreline and is a secluded strip next to Lake Michigan. The beach is open to visitors but only during the day. The sand dunes here are some of the biggest in the area at over 200 feet tall! Have fun and explore the rolling sandy slopes and or go for walk on several excellent hiking trails. There are dozens of restaurants nearby where you can have a refreshing drink and a light lunch. Several souvenir shops can also be found close to the Saugatuck Dunes State Park Beach. Some of the must-do activities around here include boating on Lake Michigan and enjoying a nice picnic with friends and family. If you’re looking for a quiet place with no tourists and no local vendors trying to sell you anything from donuts to souvenirs, North Manitou Island is a perfect place for your summer vacation. There are over 15,000 acres to explore here and plenty of options for activities including chilling in the sun, hunting, camping, and hiking. In the afternoon, you can head out to one of the villages on the island to meet the natives and at night, travelers can go and explore an eerie ghost town! 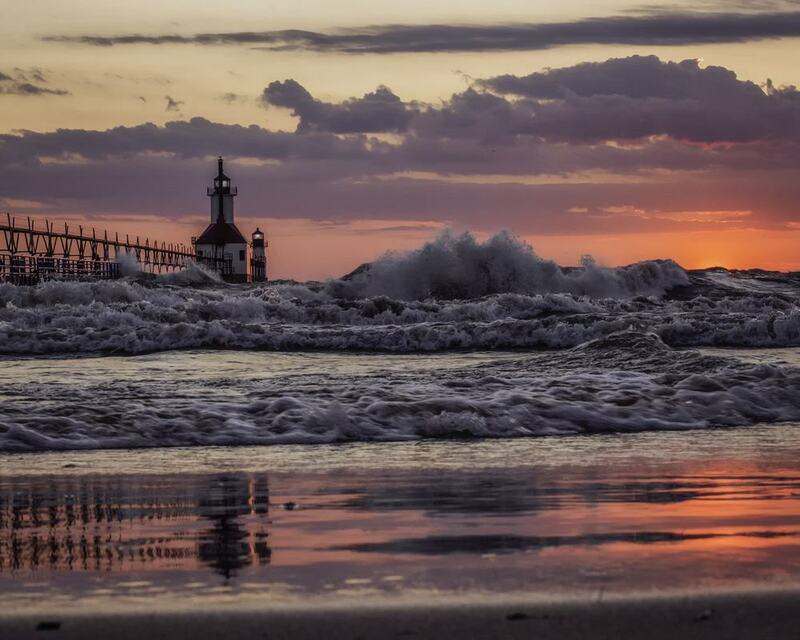 South Beach Park is one of the most visited beaches in South Haven and is known for being a perfect place for families with children on vacation. Visitors from all over the state come here to relax on the beach and take a dip in the water. There is an excellent skateboard park close by to see kids and grown-ups showing off their skills and in the evening, enjoy South Beach Park’s amazing sunsets that we hear are beautiful throughout the year. The great thing about this place is that there are plenty of useful facilities like restrooms, showers, and picnic areas. This is probably one of the reasons why it’s difficult to find a free parking spot at South Beach Park, especially on the weekends. Featuring 180 acres of awesomeness, Tawas Point State Park is definitely a perfect place for a summer vacation in Michigan. It is often referred to as Cape Cod of the Midwest and offers a designated beach with ideal swimming conditions. There is an extensive campground in the area and the water on the beach is quite shallow, which makes it safe for children. Travelers can take a tour of the lighthouse or go bird watching near Lake Huron Flyaway. There are nearly 300 species of birds migrating through this region! 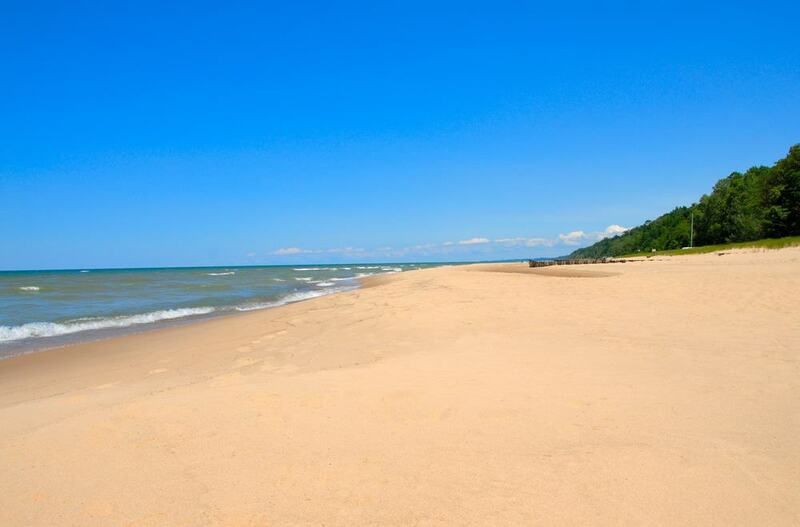 Vacationers who are searching for a picturesque beach where they can swim safely and unwind with a drink, will definitely love Tawas Point State Park. Hoffmaster State Park Beach is located close to the North Shores and has almost three miles of Lake Michigan’s coastline. 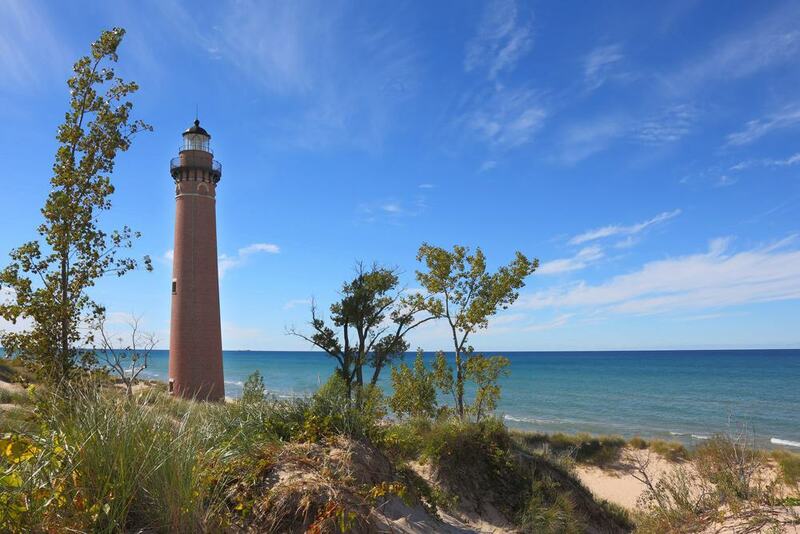 The beach stretches from the Gillette Sand Dune Visitor Center to the Lake Michigan Dunes and there are many miles of wonderful hiking trails nearby. There’s a campground site where travelers can spend a night or two. The site boasts all the needed modern amenities for a comfortable night of camping. 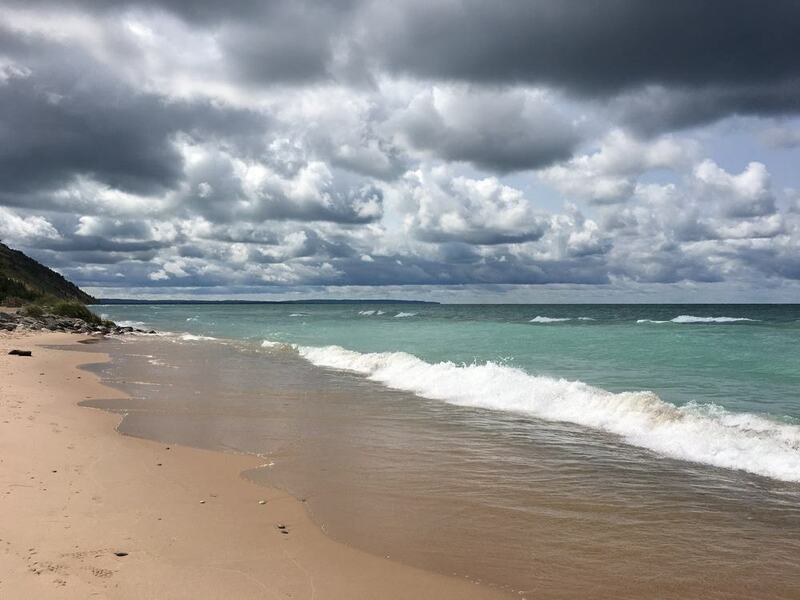 The views of Lake Michigan from Hoffmaster State Park Beach are absolutely amazing and bird-watching is one of the main activities here since migrating songbirds including sparrows, warblers, and thrushes can often be spotted.